You can FINANCE new vending machines, as low as zero down. New machines come equipped with credit card readers, and the latest processing technology programs. Location ready, no surprises of broken wires or worn tracks. OPERATORS ARE REPLACING OLD MACHINES, to achieve proven increase in product sales. New machines pay for themselves faster, by being more efficient. You can place more NEW VENDING MACHINES, indoor and outdoor locations, compared to any micro market available. Be a part of the fastest growing business, the CONVENIENCE BUSINESS in 2019! 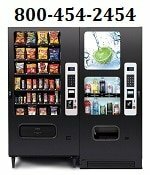 Achieve GREAT TRAFFIC locations because you have the NEWEST and best vending machines on the market today! LARGE locations want new machines, because the machines are MORE profitable, more durable and last longer! CONTACT the new vending machine sales suppliers below for more information.